Last fall, a string of fierce typhoons deluged metro Manila and displaced thousands. Fathers of sponsored children in CFCAís Antipolo project, members of a group known as ERPAT, which stands for ìEmpowerment and Reaffirmation of Paternal Abilities,î helped with rescue and relief efforts. Their work impressed international relief officials and as a result, the ERPAT fathers received two UNICEF grants to help non-sponsored children traumatized by loss cope with their feelings. The following account illustrates one fatherís success and demonstrates why UNICEF chose to recognize the fathers for their efforts. An ERPAT father named Federico shared his experience in helping Allan, 10, overcome the trauma caused by Typhoon Ondoy. Allan and his family stayed in one of the Antipolo evacuation centers until April. Children used artistic means to express their loss after the typhoon. 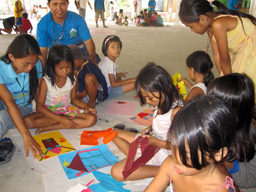 The ERPAT fathers held activities for the children on the second floor of the center. Allan was always silent and withdrawn. He glued himself to the window, staring toward the direction where his familyís home was. He refused to take the meals served at the activities. Then, there was an artwork activity Federico facilitated that allowed the children to express their feelings. Allan, while staying at the window, was encouraged by Federico to draw what he was thinking about and talk about his feelings. Federico is a sculptor and construction worker. When the children finished their artwork, they sat around where Allan was. They were encouraged to share their drawings and feelings. Many children expressed loneliness that their homes were destroyed and their belongings that were lost. The group influenced Allan to talk. Allan cried because he saw his pet dog struggling from the current of floodwater until the dog disappeared. After that, their home and the surrounding homes were sinking. He cried and cried. After his sharing, Federico asked him how he was feeling, and Allan responded that he felt better. Federico deepened the value of the activity: emphasizing that life is more precious than anything else, the acceptance of the natural disaster, the letting go of the losses, and the love of nature and God. Federico closely observed Allan in the follow-up activities. As the day went by, Allan was interactive. He played with other children and joined them in meals. Allan and his family returned to their newly repaired home assisted by the government, and Allan resumed schooling. Read more about the ERPAT fathers on our website.